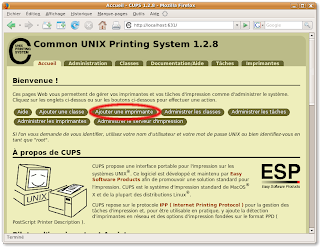 A tutorial for installing the all-in-one printers Canon Pixma MP600 and MP610 under linux, using the cups printing system. Canon proposes drivers for the MP600 printer and scanner, and now for the MP610 too. Go to the site : canon-asia and select the MP600 or MP610 printer. This file is available on the MP638 page. Before starting printer installation, note that for 64 bits systems, a small tweak has to be added to have Canon's driver point to the correct lib location (32 bits). See Joerg's comment here on how to set it. The easiest way to install the printer is to use the cups interface from a web browser. - Select the name of your printer (e.g. 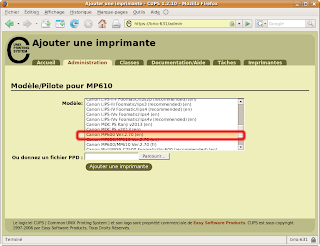 MP610) and various information and click "Continue"
This is a basic ppd file, but will work for MP600 and MP610 printers. Choose this one, then click "Add printer"
Or if you want to use another ppd file, enter its path in box, of click "browse" to select the ppd file. This will be the way to choose a new ppd file, like the ones proposed in my later post. - Then, depending on the version of cups, you will see the default printer options screen (below), or directly the printers screen. You can always change the default printer options by clicking the "Set printer options" button. From here, you can also print a test page by clicking the corresponding button, and check whether your MP works. Merci pour toutes ces infos. J'ai acheté aussi une MP610, et la fonction imprimante marche sans pb avec tes infos. J'attends tjrs le driver pour le scanner. Bonjour et encore.... MERCI ! 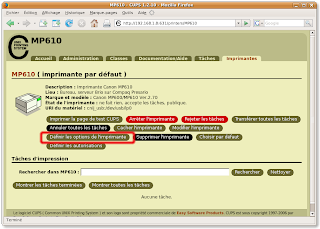 je suis sous Ubuntu 7.10 et je voulais juste dire, au niveau de ton tutoriel que le paquet libtiff4 remplace à présent libtiff3. Thank you very much for this extremely helpful blog. I have now got my MP610 working perfectly (including the Scanner) with Ubuntu Gutsy by following the instructions here. Great. Thanks for your feedback! Thanks for writing such an informative guide. I am trying to install an MP600R printer on Ubuntu 7.10. The printer is not connected through USB, but rather is accessible though a network connection. I have installed the two driver files (common and mp600, v2.70) through alien, and have added the printer through the CUPS webmin, using the updated ppd file from Sourceforge. I have tried the ipp, http and lpd protocols. In all cases, the printer looks as if it is added correctly (no error messages when pressing "Start Printer"). Unfortunately, I am not able to print any pages: jobs are added to the queue, the printer goes into the "processing" state, but nothing ever happens. I can delete jobs from the queue without problem too - I just can't print. I've combed the nets for any information, but couldn't find anything pertaining to MP600R and network printing. Any ideas how to debug the issue? As a Windows printer, if the network is setup correctly (ip @, mask, ...), doesn't it communicate through the SMB protocol? Thanks for the suggestion! The printer is not shared through a windows machine, but rather is connected directly to a switch. In case someone else encounters the same issue, I actually managed to get the printer to work by specifying CUPS protocol as "other" and typing socket://10.0.0.2 as the address (obviously, replace with the ip of your printer). Using the updated ppd file, everything works fine as far as I can see. Thanks for the tip Stephen, good to know that MP600R supports the JetDirect protocol, which is much more reliable for network printers than SMB. Just a quick - Merci! if you get an error after adding the printer, try select something like "Canon MP610 series USB #2 (Canon MP610 series)" instead of the "status readback" entry. Btw to add an printer you need an ROOT account if not configured otherwise! Thanks for this very useful how to! I now can use my mp600 with my debian machine. But i ran into some problems.First was that the driver didn't install the filter pstocanonij in /usr/lib/cups/filter/. So i had to copy it manually from the .rpm -file. Second problem is that i don't get a bidirectional communication. When using CUPS to add a printer, the "USB printer #1 with status readback for canon ij" isn't in the dropdown menu. Are you sure you installed the 2 packages (rpm converted to .deb packages) ? The package cnijfilter-common-2.70-1 installs some files, among those, pstocanonij and cnij_usb, the Canon USB backend for MP600. You need to install this last one in /usr/lib/cups/backend/cnij_usb to get the USB backend in the cups backend install menu. from the directory where you have the 2 .deb packages sitting. I checked the installation and aptitude says both packages are installed. But no matter what i try, pstocanonij and cnij_usb are not installed. After copying the cnij_usb file, i also have the "USB printer #1 with status readback for canon ij"option in the cups device menu. When i go on cups says that „device-uri“ „cnij_usb:/dev/usb/lp0“ is bad. Probably because /dev/usb/lp0 does not exist on your system, which means there's a USB issue, or the device created by udev is different on your system. Does lsusb list the printer ? Also, can you check with dpkg -l that the files contained in the 2 Canon converted .deb archives are correctly listed. I checked lsusb, and there is only one entry from the MP600s card reader. I think this is some USB issue. Unfortunately i didn't have time to do some more about this yesterday. I will do this today. Concerning the install packages, the file list of common package does not include pstocannonij nor cnij_usb. I went through the installation procedure again. This time i used the .rpm packages from the australian support website and with these everything is properly installed. Concerning the usb: /dev/usb/lp0 does exist. I also removed and reinstalled cups but it didn't change something. And, I am using GNU/Debian SID. I had same problem as biaaas had. After some trial & error, finally my MP600 worked. 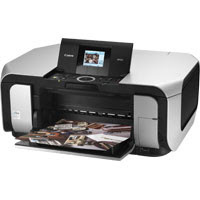 I chose Canon MP600 USB #1 (Canon MP600) not 'USB printer #1 with status readback'. Thanks for your hint! It prints now, but without the status monitor. But thats not a problem because the infos are also shown on the printers display. The current cups comes with drivers for the mp610 that were automatically detected and installed for me(gutenprint version). thanks for your very useful blog! I managed to get my printer working using USB, but I was wondering how to get it to work over bluetooth. Anybody? Unfortunately I can't see how to get this working with Gimp. This configuration relies on the printer database in /usr/share/foomatic/db, which doesn't seem to know about the MP600R. Is there a suitable foomatic driver? Or can I get Gimp to use the PPD file from Cups? Got it: I told Gimp to configure the printer as Adobe PostScript. You can then browse to the canonmp600en.ppd file, and start printing high-quality borderless photo prints! MP600 can be installed either with the Gutenprint driver, or the Canon driver, as explained in this blog. MP600 printer will not be autodetected by Gutenprint, as this model is not explicitely declared, but you can choose manually the IP4200 or probably MP610 driver to work with. Or you can also install Canon's driver if you prefer. The advantage of Gutenprint is that it supports printing on CDs (works for MP610). But I think it lacks borderless printing, that Canon's driver can handle. So probably best is ... to install 2 different printers, with the 2 drivers, Gutenprint and Canon's. For scanning, Intrepid still carries Sane 1.0.19 (as no new Sane version has been released yet), but the pixma backend is now really outdated, compared to Sane CVS version. My recommendation is thus to install Sane CVS, simply over Ubuntu's sane installation, for your MP600. when I try to print several pages in duplex mode with the canon driver. Maybe running out of free disk space ? In duplex printing mode, the driver stores the recto of each page in a large file, placed in /tmp partition. Thanks Nicolas, that may well be the cause. It would explain why printing with lower dpi would be less of a problem. I also found that I get errors when I set the page borders too low. Hi to everyone. I have Linpus/Fedora on my Acer Aspire One. I tried to follow instructions of Nicolos, but i have problem with .rpm installation. When i try to install by double click these driveres i become message:"error resolving dependencies...missing dependency: cnijfilter-common = 2.60 is needed by package...". And then i typed in Terminal as suggested, and it made something, but i don´t know what (newbie to Linux). Still, when i go to Printer Setup, there is no Driver for MP610 (i have MP620 hoping that Mp610 driver will work). https://localhost:631 doesn´t work by me-unable to open that link. Does anyone knows what could be problem there? Did you get the 2 files cnijfilter-common-2.80-1.i386.rpm and cnijfilter-mp610series-2.80-2.i386.rpm ? 2.80 here is important, this is the actual version to install, not something with 2.60 in the name. I actually followed Nicolas instructions, and there is 2.80 Driver in Print Settings, but i don´t know why my Computer doesn´t detect MP620 (bjnp://192.168.0.250:8611), because usually it did it. I have only Samba and IPP options. So, kow i have driver but undetected printer. Anyone knows what is to do? I realized that my Printer is recognized only when i have installed commercial turboprint-so i installed it one more time. Now, my printer was detected, but i took canon mp610 .ppd file that i found here-and it works perfectly! I would like to know why i can use yours drivers after installing (but not using) turboprint? Anyway thanks all-i hope this will be permanent solution for me. So you manage to set up by yourself – almost – all the installation procedure. This is probably what Turboprint did, after its installation; it installed a bjnp driver in Cups, and now this is working fine in Wifi with Canon’s driver too. Now the point is, maybe you can stay with it, or you can uninstall Turboprint completely and install in place, this cups-bjnp driver. But will require some additional skill, as you need to compile it first (instructions are given in the package, or by googling a little). We can help you, if you want to give a try compiling under Linux. Thanks Nicolas-that was very logical explanation to me. As said, now the printer is working perfectly. I am not sure if i want to install these drivers if i don´t have to, because i can have Turboprint installed, so long if i do not use their drivers, but the ones here found. And finally everything is working smootly. But as said, i am newbie to linux, and i will surely find other questions. Thanks for a very helpful site: I have got my MP610 printing and scanning using your advice and files. Unfortunately I have a problem printing from gimp which may be due to the pstocanonij filter. Can you help? I am using Fedora 10, CUPS 1.3.9, Ghostscript 8.63 and Gimp 2.4.7.
error which others on this page noticed. E [11/Dec/2008:14:05:39 +0000] [Job 21] pstocanonij write error,32. E [11/Dec/2008:14:05:39 +0000] PID 13135 (/usr/lib/cups/filter/pstocanonij) stopped with status 1! I [11/Dec/2008:14:05:39 +0000] Hint: Try setting the LogLevel to "debug" to find out more. E [11/Dec/2008:14:05:39 +0000] [Job 21] Job stopped due to filter errors. This also happens if I try printing the ps file from gv. Changing the output resolution or output rendering quality seems to make no difference. I experimented more by creating a file in gimp which printed OK, then scaling the image, while keeping the image at 300dpi. Somewhere between image size 1224 * 918 and 1400 * 1050 a new error arose: the print job appeared to start and the printer display showed activity for a long time but no pages were printed. The debug output shows an error (in ghostscript?) which is ignored and silently changed into "no error" a few lines later! D [11/Dec/2008:15:50:28 +0000] PID 13919 (/usr/lib/cups/filter/pstops) exited with no errors. D [11/Dec/2008:15:50:32 +0000] [Job 31] CIF COMMAND ERROR :file access Error! D [11/Dec/2008:15:50:32 +0000] PID 13920 (/usr/lib/cups/filter/pstocanonij) exited with no errors. D [11/Dec/2008:15:50:32 +0000] PID 13921 (/usr/lib/cups/backend/usb) exited with no errors. D [11/Dec/2008:15:50:32 +0000] [Job 31] File 0 is complete. I [11/Dec/2008:15:50:32 +0000] [Job 31] Completed successfully. The cups 1.3.9 Jobs tab on https://127.0.0.1:631/printers/ also claims that the job completed successfully. and (so far) this seems to be associated with the silent fail rather than the pstocanonij write error,32. I have no idea what is going wrong here. I have used the .ppd file provided from the australien Canon web site, but noticed it does not support printing black and white using the black catridge (!!!). Got pretty angry when I noticed that it was using my precious color catridges when printing black/white text, even though I had selected "grayscale" in the setup. Anyway, I'm not a ppd expert, and could not see any black-and-white specific section in the enhanced ppd file. So I have to ask - will this file print b/w when told so? Actually, this is a Canon printing driver, so the cartridge management is designed here by Canon. Isn't the situation the same with Windows ? Are you sure the Black cartridge is not used for B/W text ? Maybe this depends also on the printing quality you have selected. FYI, the MP610 driver, which is very similar to the MP600 one, uses the black cartridge for B/W printing, as far as I've noticed. There's no way from the ppd file to tell which cartridge to use (managed internally in the driver), only the Grayscale option is available. "... only the Grayscale option is available." Looks to me MP600R is an MP600 with Wifi, they are from the same generation. MP610 was released later, but although the printer part is very close to MP600 or MP600R, the scanner part is different, and introduced several evolutions of the Pixma protocol. MP600 and MP600R scanners use exactly the same Pixma protocol. Just to clarify - when I said my printer used the color catridge for b/w printings, that was a bit inaccurate. What I meant, was that if I print eg. a pdf with some color in it, and select grayscale in the print dialog, it will come out with color (and not in grayscale). It turns out, that this happens when I print from a KDE program (eg. okular), but not if I print from eg. my browser (Opera). So the bug is not in the driver or the ppd file, but probably in the KDE printing tool. Just wanted to make that clear, in case I scared anyone in my previous comment. I'll post back if I figure out how to fix my KDE problem (any hints appreciated of course). for what is worth it... anybody has had any luck on Ibex 64bits? I was trying to rebuild the cnijfilter from the source (available as tar-gz archive from the canon website), but it fails. I am a novice with dpkg building, though I'd consider myself as quite computer literate (15+ years on linux boxes). Is there anybody who has managed to apply "the recipe", succesfully on a 64bit box? Are the files available here (canon usa) of any use? There are no linux downloads, but some files are/may not be OS dependent. sorry.. me in rapid fire again. I think I've understood what's the problem with the package rebuild. The "source" archive contains several lib*.so.x.x libraries distributed as binaries, and I'd guess they are compiled on a 32bit architecture. Need to check more about this, but this is my current best bet. For now I'd be happy to manage to print from Ibex, can do without scanning for the immediate future. Again, any 64bit happy ending story? You need to install the lib 32 files from your distribution, and add a link to pstocanonij in the lib64 directory. I've bought an MP620 and am trying to get it up and running with Ubuntu 8.10. When I plugged it in it was auto-detected. I then upgraded the ppd file. When I try to print, the laptop indicates the job was submitted. The screen on the printer then says "Preparing", then "Printing from PC", then the display on the printer goes back to normal, as if the print was successful. Printing a test page from the printer itself works fine, i just get no output when printing from PC. Any hints? I had the same problem with biaaas with my mp610 printer („device-uri“ „cnij_usb:/dev/usb/lp0“ is bad). As Karl said I installed it with the Canon MP610 USB #1 (Canon MP610) option. I also used your new .ppd file that you describe on a later post. The status monitor works fine on me (ubuntu 8.10). Thanks a lot for all the work you have done and for your time to share it with us!!! I'am starting user and working with Ubuntu Debian . while installing I get an error that libtiff cannot be found. Does anyone know the new directory name? This is a great resource. Thank you for maintaining! Using this, my MP610 has worked w/o problems for 6 months on Ubuntu 8.10. Today, I (finally) tried to add scanner and since then, I cannot print anymore (scanner is working ;-). I reinstalled printer according to above instructions, but I get "Bad device-uri "cnij_usb:/dev/usb/lp0"!" at the final stage in CUPS. At same time, my computer is automatically installing "Canon MP610 Series" - URI : ipp://localhost:631/printers/MP610_series - usb://canon/MP610 series. Sorry, I will probably do something stupid, but anybody any idea (I have been searching the internet for the last 3 hours). Actually, there's a bug in cups 1.3.7 and 1.3.9 which prevents from adding a backend name containing an underscore _ in its name. The Canon backend should be running then. 3.2. Select "USB printer #1 with status readback for canon..."
Any more ideas ? Thank you for the support! i.e. the Gutenprint stuff automatically set up when plugging in your MP610 onto your Intrepid computer ? Does anyone knows what it should be? I installed turboprint drivers-wanted to make the same trick i made with my Linpus, but it doesn´t go. i printed after all a dokument with gutenprint driver for mp610, but the letters are streched and the print quality is very bad. Does anyone knows how to solve this problem? I updated gutenprint. And when i choose the newest file for mp620 or 610 (5.2.2.) -nothing. But when i choose older version (5.0.2) of mp610 it is printing-but with all the problems mentioned before. To install the Canon MP610 driver, there are 2 files to install, but the order is important, as one depends on the other. After that, go to System/Administration/printing in Ubuntu's menus, and set the printer choosing driver "Canon MP610 series Ver.2.80" and backend "USB Printer #1 with status readback for Canon". If you get an error-client-not-possible choosing the backend, post again, this is probably due to the CUPS bug. > no print ""Unable to start filter "pstocanonij" - No such file or directory."" >> any sticky driver installation ?? No need to spend any more time on this amateur. I will take my time to investigate deeper. Thank you for the great support and I will keep you posted of my findings. If you uninstalled the Canon drivers, then you must restart Cups to clean up the devices/backend list. Here, it looks like you try to use the uninstalled Canon driver (Canon MP610 series Ver.2.80en). I tested turboprint (commercial drivers), and all is working ok. Then i removed it. But nothing-as they do not exist. Before that i tried to install the two packages recomended here. Once more time, thanks for patience. And one more thing: when i try to copy ppd file to /usr/lib/bjlib/ it is not possible because i have no /bjlib/ directory. Must be boring to reply in stereo, but I could find the problem : /dev/usb/lp0 had 'scanner' as group. When I set to 'root'+chmod 777, I can access the printer with any configuration. Switching printer off and on resets to scanner+664. Any idea how to solve permanently ? And even after chmod+chgrp, the printer hangs when selectying Make/Manufacturer in CUPS (is thus bug with CUPS and '_' from your first reply ?). Yes. it's all in these excellent blogs. I just didn't see it : I followed the instructions from Mark L on http://mp610.blogspot.com/2007/11/new-sane-scanner-driver-for-canon-mp610.html?showComment=1227027360000#c7028403164034511065 to change group to 'lp' instead of 'scanner' and everything works fine. I successfully install a new pixma mp630 printer. There is no option in menu to print in grayscale mode instead of color mode. I am wondering if anyone has tried to setup MP620 printer for Ubuntu Jaunty Alpha release. It does not seem to work at all. Here is my experience. One of my machines installed Ubuntu 8.10 32bit. Out of box, Ubuntu 8.10 recognized MP620 printer on USB port. I simply set it up using Driver for MP610 (CUPS+Gutenprint v5.2.0), and select media source as cassette, I could send my print to the printer. Granted that the printing is awful as reported by other people (http://ubuntuforums.org/showthread.php?t=1016130), but it at least printed something. Now on Ubuntu Jaunty Alpha 4 AMD64, I did exactly the same setup as my Ubuntu 8.10 choosing driver CUPS+Gutenprint v5.2.3 for MP610, but when I tried to print, nothing happens to the printer as if printer has not received any printing job from my PC at all, although Ubuntu Jaunty does recognize the printer MP620 attached to the USB port. After I installed the cups-bjnp driver from http://sourceforge.net/projects/cups-bjnp/, Ubuntu Jaunty even found the MP620 printer on the network, but it just does not print at all. I followed the instruction from http://ubuntuforums.org/showthread.php?t=1016130 and it works now on Ubuntu Jaunty alpha 4. The only extra thing that I had to do is to get libcupsys2 package. You will get error if you try to get libcupsys2-dev package, but you do not need it anyway. I've tried to get this to work with my MP600 on Kubuntu 8.10 (Intrepid), but without success so far. I've tried the 2.70 drivers with the "Canon MP600" (hal:///org/freedesktop/Hal/devices/usb_device_4a9_1718_339491_if1_printer_noserial) or "Canon MP600 USB #1" (usb://Canon/MP600), and (with the addition of the 3.00 common drivers needed because I'm running CUPS 1.3.9) the "USB Printer #1 with status readback for Canon IJ" (cnijusb:/dev/usb/lp0). I've tried with the default "Canon MP600 Ver.2.70" ppd, and with both the 1.2 and 1.3 ppds from this site. In all cases printing a test page has no effect. I've even tried the "paper switch -> cassette" change suggested for the MP620, with no joy. I _can_ print successfully using the "Canon MP600" or "Canon MP600 USB #1" devices and the gutenprint iP4200 or MP500 ppds (the MP610 ones work for B&W and yellow, but cyan and magenta are spread horizontally by a factor of 2), so the USB etc. is definitely working. Any ideas? Any debug/diagnostic logs I can look at to see where its failing? You'll need to edit your ppd file, and then add it to your printers after editing the file. Note that if you are copying from this website, it seems to double up everything you copy, so just be careful. Thanks again Nicolos for your work on this blog. When I print with the printer attached to the router it wakes up and has the processing window, the router says a job is printing but nothing ever happens. One of the problems from the support page is that the router does not talk to bi-directional printers. Can I turn this off? ok i get mp620 to print nice! manually copied files to folders as in rpm, stop/start cups, readd printer, it worked! I have streched characters as well, but I couldn't follow Your solution. I would appreciate, if You could give a beginner a bit more explanation. 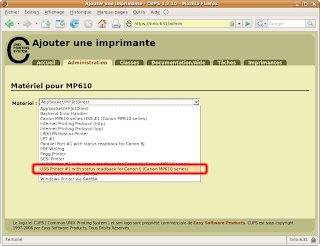 Ok, i think that i should try to install cups-bjnp to make my canon mp620 working with wifi. Can anyone to me as newbie say how to install this bjnp? I have a canon mp620. whenever i click the grayscale printing and print.. i am using the color cartridge to print b&w. The 2 black cartridges on this type of printer are not especially for color or black/white printing. - the small one is for photo printing, to give better contrasts and photo rendering. So usage of the small black cartridge is relatively scarce, compared to the big one. I install the last packet, but not works. I use cups and I will hope see my Canon Pixma MX850, but never appear, have anybody any idea to tray it? I search yet a lot, I don't know what to do, anything It will be good to me. I had problems following the instructions of this post. I have connected MP620 with WLAN. As driver I use MP640. 1. install packages for MP640 from canon asia website. 5. change connection method, which is default cnjnet to bjnp. No need for other files, no need for special ppd. Thanks to all who have posted advice. I am still having trouble getting my MP610 to print in spite of all the advice. I am running a recently installed fedora 12 system. I have installed cnijfilter-common and cnijfilter-MP610 packages and the updated ppd file. The printer is recognised and, as others have reported the small LCD on the printer reports "Printing from PC" when I submit a job, but nothing comes out. I have checked the paper feed as has beenm suggested, but with no change. I [29/Apr/2010:18:25:22 +0100] [Job 25] Printer is now online. Any ideas would be gratefully received!! I just want to confirm, that my above procedure was also tested on Ubuntu 10.04 and it worked. Just went through this process on Kubuntu 9.04, here are my final notes to complete the process. Thanks to everyone for sharing the info! Works as a charm on Fedora 12 x86_64. Well.. the finish line has been moved! Have problem that test page apparently goes to printer, but nothing happens at printer. Cassette tray issue (prev posts) didn't seem to fix it. i.e. the 'plain' MP600; ditto plus USB; Gutenprint plus USB; and USB with status readback. no probs with CUPS setup doing above (though did have some issues when trying with older canon drivers etc). can print head-clean-test, alignment-test direct from printer. Tried using command line options including lp, and following canon-driver printer-info (html files), tried 'cngpij' and 'cif' commands. Nothing prints on all accounts, and for latter two, from terminal gives a message about not finding a lib file (I could fiddle with a link if i knew that was the only issue) and then mysteriously hangs in the terminal, doesn't give UI. Have also tried two different USB ports on my computer, without any difference in results. another odd-ish thing is since these driver installs, on reboot (yes, tried rebooting after nearly all my printer setup attempts) with the printer still on and plugged USB, computer boots through BIOS, then pauses a few minutes on cursor, before continuing to GRUB and loading kernel and splash-screen. not sure if is result of printer still on and connected..? Phew. still trying to nut it out (all day and night!). if anyone has ideas before I solve it, please post. Hopefully I will solve it and can give you all update on what currently works for this Hardy / MP600 combo! then jumped to the CUPS ppd thread, downloaded that stuff and copied files over as per README info. Following other posts (incl on the CUPS ppd thread), allowed debug info on the error log via terminal commands (easy way to do this - try checking the box in the CUPS admin page?). Then, with these links fixed, two other required links (already documented) showed up as well - libtiff3 and libpng3. ANY? help for Lucid on this? All of the above and then some tried and no success! Then, reboot or restart udev. I selected the MP610 CUPS+Gutenprintv5.2.4 simplified driver for my MP600 and printed a test page. First of all.. My printer is MP600 and i get the msg "error code 6010" on my display. I'm used to windows and the more simple way of installing.. I want to print on MP610 but from Solaris 10 running on a PC x86-64 is what the connnection on my local network router. The printer is connected phuysiquement on a Mac. The printer is compatible with Solaris 10? I did some tentet via Preferences / add printer but to no avail. Is there a chance that the printing works and I have to purchase a HP? Wonderful news about that Linux Printer. a recent update of Lucid (Ubuntu 10.04) broke the following link which will need to be reset. I see a few others had issues with Ubuntu Lucid. Only a few months after my previous posts, on solving the issue with Hardy x32, I myself did an upgrade to Lucid 10.04 x64, and had little trouble, the only difference to my Hardy solution was I only needed half the symbolic links of my previous post. Now, I've had to do another fresh install (HDD was being dodgy, replaced it) and this time, the Ubuntu was done with 10.04.1 version and all online upgrades. Then when trying to setup MP600 as per previously, I had the architecture issue covered by diroots' link above. That got the printer recognised, and could scan, but at present, printing doesn't happen. Still searching for answers. but still had to use a combo from both methods to add the mp600-specific deb package, and then make a symlink for /usr/bin/cifmp600. "/usr/bin/cifmp600: error while loading shared libraries: libtiff.so.3: cannot open shared object file: No such file or directory"
So, has the location for libtiff moved in ubuntu in the last 12 months of upgrades, and cifmp600 needs a symlink in another location? or has something else happened that makes cifmp600 unable to recognise the link? file permissions allow reading by all, would have thought that was all it needed. So when the mp600 driver was installed, and complained about not finding libraries, it was because I had to create the symlinks for the libraries it wanted, in the relevant 32-bit directories. So, where this thread gives info for e.g. I had to change this to be ./lib32/... instead. I also had to tweak an already-existing link for libpng, as the link in the /usr/lib32/ pointed to /lib (64-bit) instead of /lib32(32bit). I also made use of a command-line program called getlibs - i had already run ia32 which added some 32 bit libraries, but getlibs allowed me to specifically install some others. For download and info on getlibs. to trace/check 32 or 64 bit libraries. this command was useful on the links because it reported the info for the target file. Hope this might help others if they hit similar issues on 64 bit installs! This is what I had to do to install on mint-12 32 bit. I get some odd print effects on the CUPS test sheet but not when printing normally. Thank you for helping me set up my Canon MP620. It was, for me, the easiest way to set up the printer on my 64-bit OS.